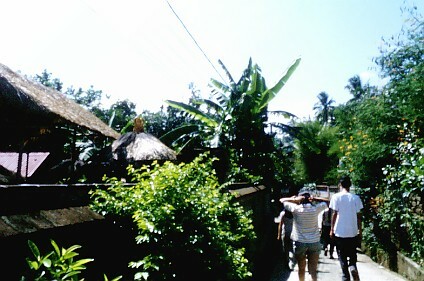 After a quick lunch at the Lotus Cafe in Ubud, we walked over to Linda's house on Jalan Kajeng. 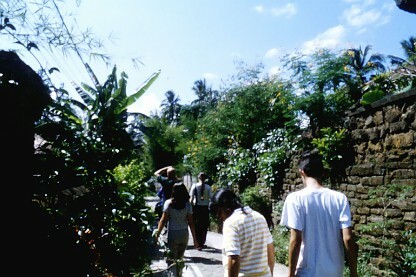 It's just a few minutes' walk from the center of Ubud. The paving stones along Jalan Kajeng are 'sponsored' by various local businesses, residents and visitors, and each stone has an inscription by the sponsor. Linda and Charlie's (her husband's) paving stone has an elephant for Linda's favorite Hindu figure Ganesa, part elephant, part boy. Astrid and Dan are busy looking at the inscriptions. Julia is further ahead, and Steve and Justine are in front with Linda. We're almost at Linda's house now. Justine and Steve ended up staying at this house, just a couple of doors from Linda. 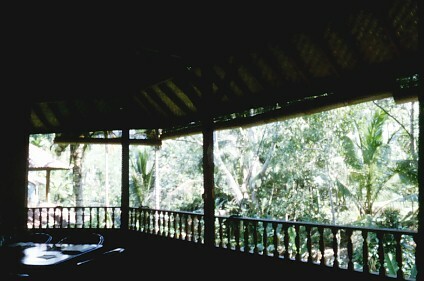 They operate a homestay, where you can get a simple room very inexpensively. 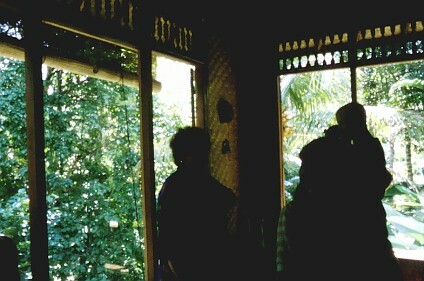 This is Linda's living room - the house overlooks a gorge, and, typical of Balinese houses, is completely open to the elements. There is no glass in the windows - just a simple blind that can be lowered when it rains. It's very cool and shaded inside, a sharp contrast to the bright sunshine outside - it's difficult to take a photo that shows the inside and outside at once - too much contrast. Another contrasty picture inside Linda's house. Here is Linda, with Astrid, and Justine and Steve silhouetted in the background. By this time we were feeling pretty beat - we'd been travelling for nearly 24 hours, and had stayed up to acclimatize to Balinese time. 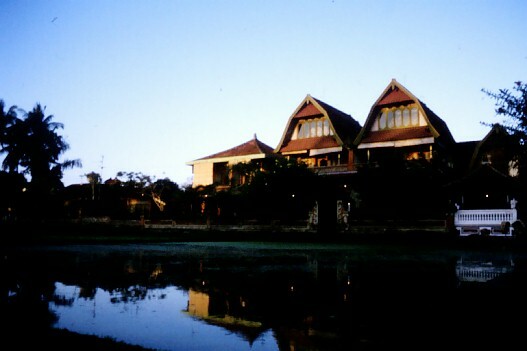 We walked back to Oka Wati's - this is a late afternoon view of our building from the other side of the rice field. Our room is upstairs on the lower building at far left, with the shade hanging down. 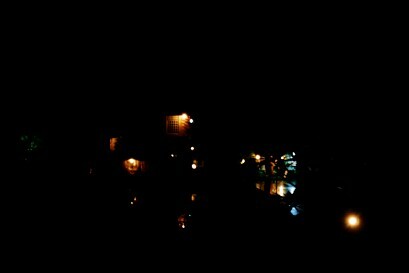 A late night view from our balcony - the lights reflected in the water of the rice field. The night seemed alive with the sounds of frogs and crickets, croaking and chirruping in the warm darkness like a night chorus all around. It felt really good to be in Bali.